Calling all of our Hit Makers fans out dere. The long awaited Puff Puff Pass E.P is about to let loose feat explosive dance floor pieces that all dancers will surely love. Puff Puff Pass Da Hit Makers Classic Blut Remix & Da Hit Makers Smoke Out Mix are both favs of mine off this great jam filled E.P and we are confident most deejays and dancers will agree that both these mixes are great for those late night packed dance floors.Get your grind with this joint here and the rest of the cuts offered in this package. The next cut Putting In Work Da Hit Makers Jersey Smoke Out Mix is a dope unreleased number with a harder kick and flowing organ riffs make this one a favorite off this fantastic package.In addition this cut is going to make some of you run to the dance floor.This jam is perfect for those outdoor summer events,so keep your ear to the ground cause this is a JAM ! Ok,let us MRA (moving right along) we have another gem entitled Deep Lounge ( D.H.M Deep Smoke Out Mix),a clap yo hands ,dope stomp your feet joint that has signature Hit Makers. written all over it. **This next cut is another favorite of mine off this package and its NOT because it has your truly on it. Soul Oasis Cyber Drumz( Da Hit Makerz and Briantech Bump ReMix ) is a dope drum break down jam filled with percussions and warm synths and remixed nicely by Brian Nance.The original Soul Oasis Cyber Drumz is also mixed by D.H.M and it?s more of a stripped down mix featuring more congas and other elements which dancers are going to enjoy. 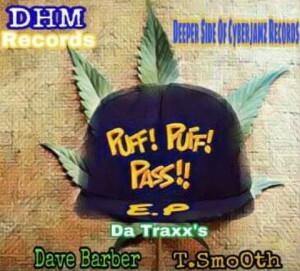 D.H.M Cyber Funk Da Hit Makers Funky Joint Mix. This cut here is a very nice and perfect for those deejays like me that love to ride vocals for days or accapella's throughout the mix.Loop n ride this or just let it play out and set up your crowd for another great night of music. On a more afro side of things we have this wonderful piece entitled Serengity Afro Puff ,a beautiful afro soul cut with lovely musical elements of percussions and laced with heavenly synths,this one is done proper as some of us roll up that blunt and prepare to Puff Puff Pass !! Let us continue to puff puff and dance to this gorgeous piece filled with electronic sythns and saxophone which is yet another gem off this hot package. All and all ,this EP is right on time for any type of weather ,especially for the Spring and Summer and highly recommend it for outdoor or indoor events. coming soon to deeperSIDE of Cyberjamz end of March 2018.